Rich in Monoi moisturizing, nourishing, restorative and protective Coconut Monoi Oil is a multi-purpose oil for body care and hair. Used in body care, it softens and protects all skin types. You'll also enjoy relaxing as a massage oil, bath oil. Used in hair care remedial and protective, it reveals the brilliance and shine of dry, damaged hair. The Monoi de Tahiti Coconut oil is deeply touching the heart chakra energy with its sweet lovely aromatic fragrances and is activate your sensual feelings. Directions : Apply to skin and gently massage with light circular movement. Hair: Apply daily to dry, damaged hair, emphasizing the points, or mask for 10 minutes before shampooing. In a spray bottle for easy and uniform application. No parabens or other preservatives. Note: - For use in summer and winter (thins near a heat source). INGREDIENTS: - Monoi - Frangipani Perfume LISTE INCI : Cocos nucifera (coconut) oil, Brassica campestris (rapeseed) seed oil, Elaeis guineensis (palm) oil, Gardenia tahitensis flower, Parfum (fragrance) Tocopherol, Amyl cinnamal, Linalool, Benzyl salicylate, Hydroxycitronellal, Butylphenyl methylpropional, Benzyl benzoate. The guarantee of origin “Monoï de Tahiti” is reserved for products with ingredients from French Polynesia in accordance with local, honest and constant uses. This product is manufactured in France in accordance with the French Government Decree Nr. 92-340 amended by Decree Nr. 313/CM dated 20/02/2008; published JOPF Nr. 2008-9 dated 28/02/2008, which strictly defines the process used to manufacture Monoi de Tahiti, guaranteeing its authenticity and quality. Monoi de Tahiti is a wonderful cosmetic oil obtained by soaking Tiare flower (Gardenia Tahitensis) blossoms in refined coconut oil. Coconuts from “Cocos Nucifera” trees, a variety growing on the coral ground of French Polynesia, and the buds of Tiare flower must come from French Polynesia. Coconuts used for Monoi making are collected at the stage known as of "ripe nut". After collecting, ripe coconuts are cleaved and coconut meats are extracted within 48 hours. These ones are then put out to dry during at least a week. The meats are then crushed in fine particles. The raw coconut oil is extracted by a unique warm pressure. 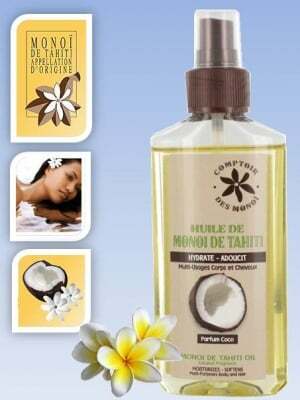 “Monoï de Tahiti” is obtained by soaking ten Tiare flowers per one litre of refined coconut oil, during at least ten days. The "Monoï de Tahiti", Appellation of Origine, obtained by this method, has a lot of medicinal properties used to elaborate and make cosmetic care products: moisturizing, nutrition, regeneration, but also for the reinforcement of hair strength. IMPORTANT INFORMATION:Monoi de Tahiti solidifies (and sometimes in a non-homogeneous way) below 22°C. This is a natural process which in no way affects its natural properties. To return it to fluidity, simply reheat your bottle of Monoi de Tahiti under a stream of hot water or in winter keep it near a heat source. NEVER USE A MICROWAVE OVEN!